Rajnish Kansal and Reena Kansal, both in their mid-forties is a happy couple with two happy kids. They are a fit family that firmly believes in healthy eating and being active daily to be able to lead a great life. 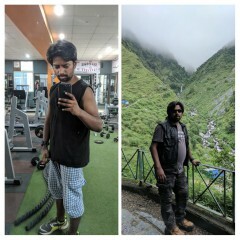 And all this change happened within a year of following the GOQii Lifestyle. Let’s hear Rajnish and his family’s story in their own words. Just to give you’ll a background, I am 47 years of age and work for a food company that manufactures and sells processed food products. I was always an active person for many years at a stretch until one day I took up this vice called ‘smoking’. For 19 long years, I was a heavy smoker. In 2006 one fine day I decided I have had enough and wanted to quit smoking – and in a spur of the moment, I just quit. Once I had quit smoking I wanted to get back to rebuilding the damage to my body. However, I didn’t know where to start from. I started following many things together without any tangible visible results. Then one of my ex-bosses motivated me towards the path of health and about 6 years ago I started my journey with first eating right. I started the process with whatever little knowledge I had and could glean from whatever sources and got into an active lifestyle. But, there was no proper regime and no discipline attached to it. It was just all over the place. It was in end-December 2014 that I got to know of GOQii and the coach service that it provides. I decided to give it a shot, and my journey with GOQii started exactly a year ago on 2nd of January 2015, today, I can confidently say that it has been one of the best decisions of my life. 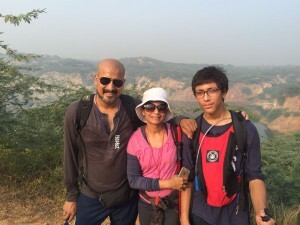 Through constant guidance from my coach and internal motivation from within the GOQii ecosystem, I have physically become stronger with an increase in my muscle mass so much so that I “dared” to participate in the 100 km Trailwalk along with my wife in November 2015 – together both of us completed it in approx. 38.5 hours! This year I am hoping that my son will also join us. I also run the half marathons regularly. I do indulge myself in cheat eating. But, it is guilt-free eating and only once in a while. I am not counting calories but I am conscious guilt-free eating and how much? Working for a processed food company… GOQii is a redemption for me! Within a month’s time of me getting my GOQii band, my wife started noticing the positive changes in me and got interested. And, I gifted her a GOQii band last year on the Valentine’s Day. Reena Kansal says: “It is one of the best gifts that I have ever got in all these years.” My food habits had already gone through a change after Rajnish got the band. So even without a band, I was following everything that Rajnish was being guided on. Post getting my own band, GOQii has brought in a lot of positives to me. My food patterns have changed. While I was always a small eater at regular intervals, what I was eating was not always healthy. Now, I eat everything but, I am conscious of eating healthy. So much so that our household cooking has become healthier and kids have also readily accepted that. It’s been a major shift for us towards eating healthy and keeping fit. Earlier I used to go to the gym but not very regularly. Forget counting steps there was no proper regime to do anything. Now I have set a goal for myself to clock at least 13k steps daily. I work for a fashion apparel company and am always on the move. Prior to GOQii, I did not have any routine but, ever since I have been on GOQii platform there is discipline in life. Now, I am supercharged and raring to go – No more being lethargic and tired. These days when I exercise, I do not give up easily. My energy levels have certainly gone up a lot. “After my wife, I got my son who is 14 years old introduced to GOQii and subsequently my daughter who is 12 years old. My family has also got moving with me now”. My kids changed their school last academic year and the kids have felt the positivity having the profound impact in their new environment as well so much so that they are now supercharged and participate in various physical activities like races etc. 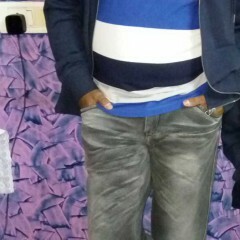 Rimuksh Kansal says: I like the GOQii way of life. I used to eat lots of sugar and sweets. Now I can control myself to eat sweets and junk food. It’s been six months since I have eaten chips. Also, I wake up at 6 am on my own. After I am back from school at 3 pm I step out at 6 pm to play. I wanted to do the Trailwalk with my parents but, I could not as I am underage. However, I did go for the 3 practice sessions and completed them as well. This ability in me is something that my coach Neha Morche has brought out. I would say, GOQii has made me a lot more active than I was earlier. Rijul Kansal is a chirpy and lively child. She is supercharged and she says: I got my band last year and I feel really good about being on GOQii. It has done a lot of good for me. I have changed my eating habits. Earlier I used to eat a lot of junk food but now I do not. I probably have once in a while where there is a picnic or something. However, I am able to control the urge for junk food. I follow everything my coach says. She has thrown a challenge of eating one fruit daily this month which I am trying to keep up. Until last year, I did not go participate much in the weekly GOQII event Active Sunday. But this year I have promised myself I will attend all Active Sundays and be very active. Because of GOQii, I am fit now. Before I had my GOQii band, I used to always fall ill during winters but last year I only fell once and that too because I had a cold drink. I do not get stressed because I am active. So I am able to participate in all school activities. Since I love running, during PT sessions I can easily run two rounds of the ground continuously without stopping. Unfortunately, both the kids are unable to wear the band during the school hours – their school has a strict “no gadgets” rule – however, what is noteworthy is that they manage to clock their steps over the weekend and above all they understand what mindful eating and being active is and how it’s keeping them healthy. Taking over from his kids, Rajnish continues, earlier we had a hard time living mindfully, but with GOQii, we are all aware when we are not moving. There are days when I look down to check my steps and if I find that I have not clocked enough steps then I go for long walks with my family – this gives me an opportunity to not only complete my step count target but also to spend quality time with the family. We are now truly a GOQii family. 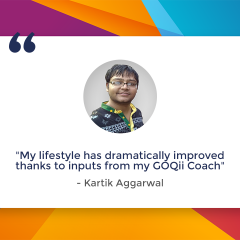 The GOQii Active Sundays have become an inseparable part of our lives – as a family, we are some of the most active players of GOQii in Delhi – and all four of us are each other’s support system. The kids love it, and Reena and I love the fact that we were giving them tools to stay healthy as they get older. And to top it all, we have an awesome set of friends now, all with a similar motto in life – be physically and mentally healthy! For us, wellness has now acquired meaning in its entirety – physical and mental, both and for the whole family. We are physically active and mentally we are far calmer now – we have started spending a lot of time with each other and pursuing new stress-busting hobbies like painting, calligraphy etc. And we are very happy, from within. In the last one year, I have realized that our demeanour has become extremely positive that people have started noticing it in all of us. Thank you, GOQii! We sure appreciate being a part of the Ecosystem that supports us every step of the way in being healthy! “Rajnish is one of the best GOQii players I have worked with. I remember; when he had come on board, we had set his health goals as reducing fat percentage, increasing stamina, bring high uric acid level under control and bringing about work-life balance. He was an athlete during his college days but, fast-paced work life caught up with him. He had specifically mentioned that he wanted me to be a pushy coach; so, I became one! We brought about a major difference in his daily food intake by improving meal quality and that helped him in fat loss. Simultaneously, we also worked on the exercise part. With time, uric acid level improved and body fat percentage improved too. 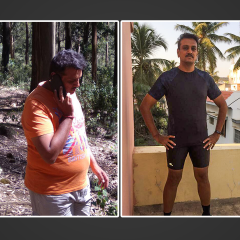 Rajnish is a person who believes in not only taking care of his own health but, has strong views on today’s generation getting fitness conscious. His wife, son, and daughter are also GOQii players. This is one power-packed family who is regular at the GOQii Active Sunday sessions!